Texas Education Agency (TEA) staff noted the agency has taken a number of steps in the last several months to facilitate the implementation of HB5. Two new courses, statistics and algebraic reasoning, will be available for math credit in time for the 2015-16 school year. The Texas Virtual School Network (TxVSN) is being marketed as a tool to assist districts in offering the endorsements prescribed under HB5 if a school is not able to offer the necessary classes. New Career and Technical Education (CTE) Texas Essential Knowledge and Skills (TEKS) standards will be ready for the 2017-18 school year. An HB5 handbook for parents and forms for districts are now available. TEA staff provided an overview of current state assessments. Approximately 48,000 students in the class of 2015 still must pass one or more end-of-course (EOC) exams. The English II EOC continues to be the most challenging for students. TEA requires questions on exams be field-tested. Questions are discarded if 95 percent of students get them wrong or right. STAAR, by design, is more rigorous than the most recent standardized assessment (TAKS). STAAR measures if students mastered the TEKS and assesses college readiness. Members questioned whether the assessment is accurately measuring student performance. With regard to accountability, TEA provided information on the new community and student engagement ratings released last week. Results show 78 percent of districts awarded themselves an “exemplary” or “recognized” rating when it came to the required state indicators and parental and community input. It is worth noting that out of the 1,227 districts and charters, 120 said they were not in compliance with the law. TEA staff will determine whether those are traditional schools or charters. School officials are expected to get letters regarding this issue next week. The House Public Education Committee met jointly with the House Corrections Committee earlier this month to discuss the impact of recent legislation on student discipline and school-based policing referrals to municipal, justice and juvenile courts. Specifically, legislators considered Senate Bill 393 and Senate Bill 1114 – bills designed to reduce referrals without having a negative impact on school safety. In 2013, the Texas Legislature passed both SB 393 and SB 1114, which prohibit citations for Class C misdemeanor conduct committed by students under the age of 17 at school and school events. Further, the new laws provide that the offenses of “disruption of class” and “disruption of transportation” can only be committed by non-students, not students. Legislators heard testimony from a number of witnesses. David Slayton with the Office of Court Administration and Texas Judicial Council noted that the number of citations issued to students has dropped by 90,000, according to data from courts across the state, which was the intent of the law. 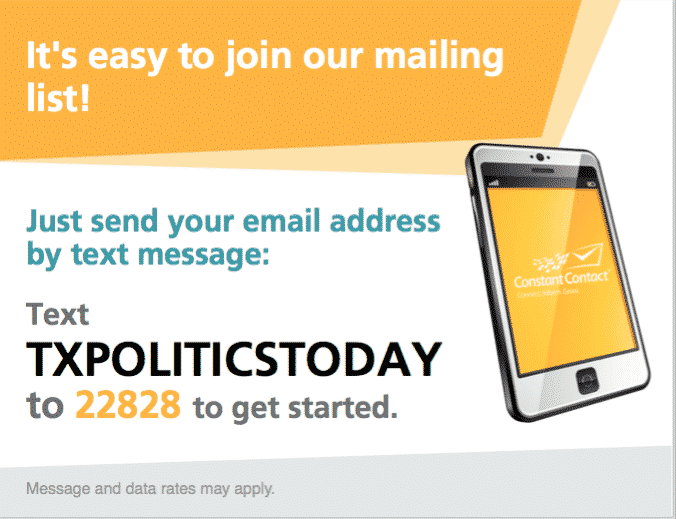 As early voting begins today, the candidates for lieutenant governor are competing for one of the most powerful positions on the ballot. The winner of the race will control the Texas Senate and bills considered in that chamber. 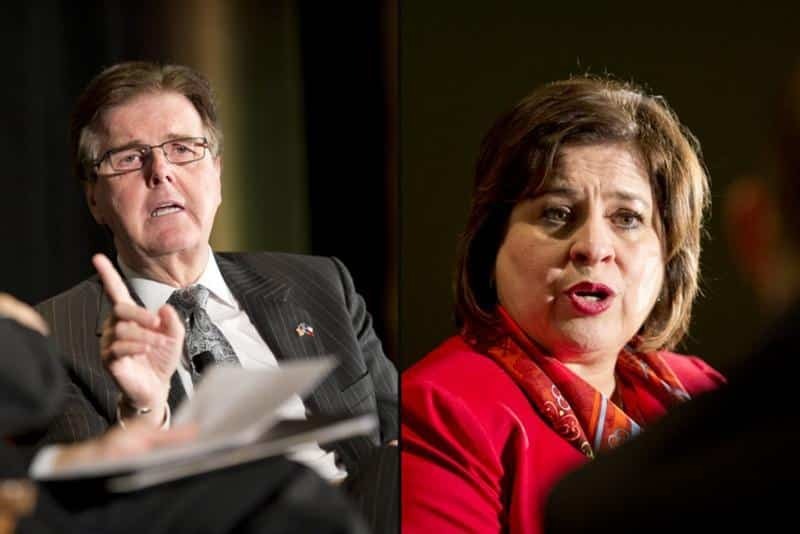 Here’s a look at how the contenders — Republican Dan Patrick and Democrat Leticia Van de Putte — differ on one of the state’s most important issues: education. The consolidation of large school districts in Texas would raise the costs of education and likely cause student performance to fall, according to a new study co-written by researchers at Texas A&M University. The study, “Anticipating the Consequences of School District Consolidation in Major Metropolitan Areas,” was co-authored by Lori Taylor from the Bush School of Government and Public Service, Timothy J. Gronberg and Dennis W. Jansen with the Department of Economics at Texas A&M, along with a researcher at Utah State University. Create More Disciplinary Options Than just Suspensions and Cops If you look into school-suspension data — state or local — you’ll find a bunch of numbers that tell you nothing about the severity of the offenses. You’ll find high rates clustered in vague categories like “disorderly conduct” and “subordination/disrespect.” Those could mean anything from mouthing off to a teacher to stealing a cell phone. And what do suspensions for “assault” mean? Assault is an arrestable offense, as are stealing, possession of illegal substances, sexual harassment and others. Not everyone knows that often schools often tuck low-level arrestable offenses into suspension data. More than 100,000 fifth- and eighth-graders failed the state exams in reading and math that are required to move on to the next grade last year. Most of them probably advanced anyway. Yes, Texas is at the top. Not just in job creation. And not just in oil and gas. No, we lead nearly every other state in the nation on high school graduation rates. The Texas Education Agency announced it earlier this year. No. 2 overall in the country and No. 1 for many ethnic groups. The only thing that stands between us and congratulations is one little thing: Many people don’t believe it. That included me — until I checked the numbers for myself. In December, roughly 47,000 high school seniors who still need to pass at least one standardized exam will have a final opportunity to clear a hurdle to their diplomas. If they don’t, their last shot at graduating this spring with their peers in the Class of 2015 may depend on the quick movement of state lawmakers. Education is the single-greatest key to strengthening our long-term economic future. Now, demographic changes in our country require a different approach when educating large numbers of children who are not proficient in English. These children, who will make up our future labor force, will be either limited in English proficiency or will be proficient in two or more languages. We have the opportunity to choose which one will serve us better. The study, The Power of the Pygmalion Effect, looked at 10 years of data concerning teacher expectations for 10th graders. Researchers discovered that those high school students for whom teachers held high expectations were more likely to complete a college degree program than those students whose teachers did not. The standardized test, a hallmark of the accountability movement that has defined U.S. public education since 2002, is under growing attack from critics who say students from pre-kindergarten to 12th grade are taking too many exams.Four states have repealed or delayed graduation testing requirements in the past two years. Four others, including Texas — where the idea of using tests to hold schools accountable for educating children first began — have cut the number of required exams or reduced their consequences. 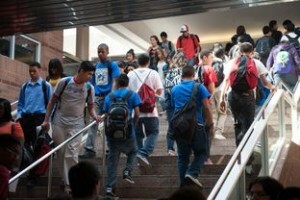 Boycotts, such as when 60,000 students refused to take exams this year in New York, are on the upswing. It is a proven fact that not every person who takes a test will pass it. Some people even have what is known as test anxiety and others will do better if the exam is oral. But that is not the kind of testing Texas is emphasizing, or can we say, overemphasizing. One organization that opposes standardized testing, Save Texas Schools, believes that all the time that is spent on standardized testing – preparation for it and the time spent testing – is cutting into, if not deleting, classroom instruction time, and pushes aside students’ development as critical thinkers. 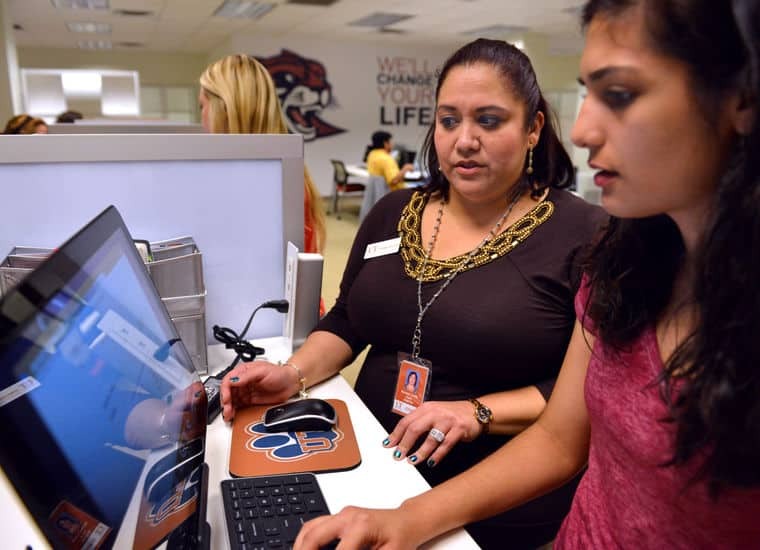 A handful of high school seniors took the opportunity to apply to college Tuesday during the soft launch of the ApplyTexas admissions application for the University of Texas Rio Grande Valley. The UTRGV application went live at noon on Monday on ApplyTexas.org. According to their website, ApplyTexas was created through a collaborative effort between the Texas Higher Education Coordinating Board and the colleges and universities represented on the site. The soft launch, which took place on the University of Brownsville campus, invited the Brownsville Early College High School and the UTB Math and Science Academy to participate in this soft launch. To improve the Advanced Placement class for U.S. history, some of the best and brightest history scholars in the country worked for six years on a new curriculum.The idea was to replace traditional memorization with more emphasis on critical thinking and some key periods in American history, such as the 1980s.It all seemed innocuous enough. Maybe even a tad dry.Then it exploded. The use of e-cigarettes by anyone on any Alvarado ISD property just got vaporized.On Monday, the AISD school board broadened the ban on the use of electronic vaporizing devices by students to include anyone on any district property at any time.